PM MODI is clearly rattled by reading the writing on the wall concerning the outcome of the 2019 general elections. As a result, he is doling out various excuses and reasons in order to portray the efforts for unity, that is emerging among the secular opposition for the ouster of the BJP from government, as an act of either opportunism, an act of money bags getting together or an act of sheer desperation; that it is Modi versus the rest in the forthcoming elections. Let us examine these claims of the prime minister. It was always clear that the advantage the BJP and Modi had in 2014 of a dispersed opposition allowed them to gain a majority and form the government by merely eliciting the support of 31 per cent of the electorate. A repetition is no longer possible in the forthcoming elections. A divided opposition despite 69 per cent of the electorate voting against the BJP, ensured that Modi could have his own majority in the Lok Sabha. But now with the state level understandings emerging in the major states that send a large number of MPs to the Lok Sabha, this possibility does not appear to work in 2019. This is the first reason for the panic that is growing in the BJP camp. In order to show this sort of a coming together of secular parties as an act of sheer desperation it is being portrayed that the strength of Modi is such, that the entire opposition is getting together. It must be recollected that in 2014 when Modi assumed office of the PM there were 42 parties that supported the BJP and many of them joined the NDA. While only a few of them had representation in the Lok Sabha; the rest of them were state level parties who were hoping for spoils of office at the levels of the state governments whenever the assembly elections are held and this happened in a large number of states. But of those who were part of the NDA and who had MPs in the Lok Sabha many have now withdrawn their support to the BJP and exited the NDA. The TDP, a key member of the NDA which gave a large support base with its MPs from Andhra Pradesh, is now out of the NDA. In the north east, the AGP whose support ensured that the BJP formed a state government there has now exited the NDA on the controversial amendment to the Citizenship Act. Likewise, in Bihar at least three of the constituents of the NDA have now deserted the BJP and moving towards an understanding with secular forces. In UP many of BJP’s smaller allies including some of them who had shared cabinet positions are seriously reconsidering their support to the BJP. In Maharashtra the Shiv-Sena is displaying belligerent opposition to the BJP and we will have to wait and see what happens as the election draws closer. Likewise, in the other states where recent elections were held many of the regional parties and smaller forces have now deserted the NDA. So, put together, what is seen is the coming together of the secular opposition forces as against the withering away of the NDA coalition. This is causing a sense of desperation in the BJP and the RSS. Prime Minister Modi today expresses his dismay over the fact that the secular opposition parties are coming to certain understandings in order to maximise the pooling of anti-BJP vote and he dubs this effort as being an opportunistic and unprincipled alliance. Of the 42 parties that we spoke of who supported the NDA in 2014, many of those were parties with whom the BJP cannot see an eye to eye. What is the commonality between the BJP and the PDP in the state of Jammu and Kashmir except the urge to share the spoils of office that brought them together? What is the commonality between the Asom Gana Parishad and the BJP when the AGP has been waging a battle and its birth originates in this battle against “foreigners” in Assam? What was the commonality between the TDP and the BJP when they fought against each other and continue to fight against each other earlier? What happened with the JD(U) in Bihar is well known; after defeating the BJP the betrayal of Nitish Kumar and the JD(U) rejoining the BJP, what are the principles involved in that. The BJP has been unscrupulous in the manner in which it roped in various political parties either by allurement or by threats and intimidation or by offering them share of power at the level of the state governments. This is reflected in the brazen manner in which it has bought over MLAs to form governments even after being in the minority like it happened in Goa, Manipur and Arunachal. These are the people who are least qualified to talk about any principles and who have literally no scruples at forsaking principles for the sake of power and they are today giving moral lectures to the people of India and to the secular parties about morality and principles! In order to overcome the desperation a belligerent bravado is being displayed by saying that Modi is the strong man the “King Kong”, so to speak, against whom every other force is coming together to defeat him. First of all, it must be understood that the ruination of the Indian economy apart from the ruination of the constitutional institutions and the social unity amongst the people has generated a deep discontent amongst the people over the last 57 months. 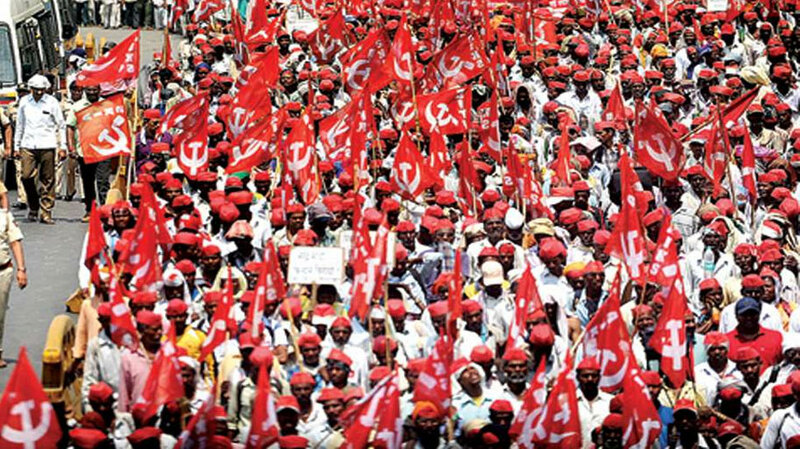 This discontent is taking the shape of popular militant struggles as was seen recently in the coming together of the working class, the kisans and the agricultural labour in a joint worker-peasant massive rally outside the parliament at Delhi. This was followed up by nearly 200 kisan organisations, organising yet another massive march to parliament which had forced leaders of 21 major opposition parties to come together on that platform and pledge support for the legislations that this movement had drafted regarding remunerative price of one and a half times of the production cost to the farmer and a one-time loan waiver to prevent growing distress suicides among the farmers. This coming together of the top most leaders of these parties on the platform of this joint kisan manch was in itself an indicator that what was dominant and what is becoming increasingly dominant in the electoral discourse for the 2019 elections are the issues of the working people, issues of agrarian distress, the issues of growing unemployment and issues of economic burdens that are crippling the livelihoods of vast majority of our people. Added element to this discontent is the brazen loot of our public money and people’s money that Modi government is facilitating by patronising and giving protection to such elements who have looted our country. The humongous amounts of unpaid loans taken from the banks, which is now estimated variously, as official figures are very difficult to come by, amounting to around Rs 12 lakh crore including interest, has crippled the banking system. Those who have looted have scooted the country and they have scooted the country under the patronage of this government. Instead of taking penal action and confiscating the properties of those who have taken such loans and scooted; the banks are being recapitalised once again by diverting people’s money that is lying in the deposits in the banks. So, this is the double whammy loot and attack on the Indian people due to the profligacy of promoting crony capitalism at its worst by this Modi government. Added to this is the exposure connected with the Rafale scam. By the day it is becoming increasingly clear that it was the direct involvement of Prime Minister Modi that this deal was brought into effect cancelling the earlier deal that was undertaken by the UPA government. This was done allegedly to benefit his own corporate crony Anil Ambani at the expense of India’s public sector, Hindustan Aeronautics Limited and at the expense of national security interests by not procuring required squadrons for the Indian Air Force which has been pleading for them for a long-long time. This loot, along with the growing economic burdens, is what is creating the parameters on the basis of which the elections are going to be fought. The electoral template is thus emerging as a solution for the people’s problems and a solution for improving the livelihood of the people that is a solution that can only be brought about through a shift in the policy direction. It is towards such a shift in policy direction that the mass support base of every single political party is putting the pressure on its leadership to ensure that BJP-RSS do not gain from a division of anti-BJP vote and comes back to power albeit with a very small minority support of the electorate. This is the factor that is bringing all these parties together when the country’s people are demanding the ouster of this government with a hope for a policy shift which will be a pro-people’s policy direction that the future must take. On top of all this is the manner in which this government has mounted a most naked authoritarian assault on all constitutional institutions and authorities. The parliament itself is being deprived of proper time to discuss important legislations. In the history of independent India, we have never seen a situation where within 24 hours without any prior consultations, without any prior preparations, without any prior circulation of the legislation, the constitution is amended as was the case in granting 10 per cent reservations to the economically weaker sections. Now this is an issue on which a consensus needed to be built and it could have been built as major political parties have all been in favour of such a move. There are very contentious legal issues involved. Reservations are a means to tackle the issue of social exclusion and to bring in these sections through a process of inclusion, through a process of affirmative action, so that the constitutional fundamental right of the Indian people of equality is ensured. But can reservations work as a measure for poverty alleviation? That is a question that has to be seriously addressed. And further, what is the criteria on the basis of which the weaker sections or EWS will be defined. The government has now issued, under the rules of this constitutional amendment, a set of parameters which says that those who earn less than Rs 8 lakh per annum will be eligible for this reservation. Now this is a very-very high limit given the fact that this government itself has set the limit of needing to be under the limit of Rs 5 lakh per annum earnings to qualify for a subsidised gas cylinder. The BPL cards and the targeted subsidies for food; all these have limits which are much lower. The working class in its two-day historic all India industrial strike has demanded a guaranteed minimum wage of Rs 18,000 per month for unskilled workers. This works out to Rs 2.16 lakh per annum. Even this, this Modi government is not willing to concede. In the light of this, to have a limit of Rs 8 lakh per annum for qualifying for the EWS reservations sounds absolutely absurd. Further, these parameters talk in terms of land holdings of less than five acres; now a five-acre land holder in major parts of the country would not really qualify to be equivalent to being poor. This Modi government has not yet brought out its own figures on what is the poverty rate in the country. It was earlier considered that those who earn less than Rs 35 in rural and Rs 66 per day in urban India were poor. Anybody earning more than that was not considered poor. All these things required to be discussed, but the parliament was not allowed to discuss at all. The parliament is the only authority to whom the government can be accountable. By depriving parliament of time, of the opportunity, the government escapes accountability. The Supreme Court; the four judges coming out on executive’s interference into its work is itself a very grave charge. Now these attacks on the CBI, the attacks on the RBI targeting its reserve funds which the government wants to draw in order to offer pre-electoral “lollypops”, as the PM says, are of serious nature. To the people, all these attacks on the institutions whether it is the CVC question marks over the EC, the CAG and at the same time large scale appointments of RSS functionaries in all universities and bodies of higher learning and research in our country; are all indicative of the fact that the constitutional foundations of our republic are being systematically and diabolically undermined. It is a sum total of all these factors that is actually bringing the people together with the single imperative in the coming general elections for ousting this government. Ousting this government means that the new alternative secular government must under the pressure of popular struggles be made to change the policy direction towards a pro-people’s policy orientation. It is this reality that is defining the discourse preceding these forthcoming elections and that is why those who are coming together to defeat this government are not doing so because of ‘opportunism’, as alleged by Modi, but in response to the urge that is being articulated by the people. Prime Minister Modi has come up with another claim that the coming together of opposition parties represents ‘dhan shakti’ or money power while he represents ‘jan shakti’ or the people’s power. Nothing could be more absurd. By changing the laws for political funding, it is the BJP that has been the beneficiary to the tune of nearly 95 per cent of all donations made through electoral bonds to any political party. And that is why when they say there is no money trail that one can find in the Rafale deal; the electoral bonds are the money trail. They are the money trails which explain how all this loot that is taking place is finding its way back into the coffers of BJP. If at all there is any ‘dhan shakti’ that is there to be seen by everybody. Everybody in India today knows the amounts of money that the BJP spends both for its PR campaigns and during elections. The truth of the matter is that it is the growing discontent amongst the people over the economic ruination that this government has mounted; it is the growing alienation of the people over the brazen communal polarisation that this government is undertaking, it is the complete utter distraught of the people to see the constitutional authorities being mercilessly attacked and destroyed, that is bringing the people of India together to ensure that this government is ousted. People of India, when they come together; the political parties to whom they belong or political parties whom they support are under tremendous pressure to come together to achieve this objective and that is precisely what is happening with the different understandings being arrived at in different states to ensure that the BJP does not return to power in 2019. And finally, the old argument that we had faced even in 2004, when the BJP-RSS came forward to say who is the alternative to Vajpayee? Today they say who is the alternative to Modi? In 2004 the people of India ensured that an alternative to Vajpayee came and it came in the shape of Dr Manmohan Singh who continued to be the PM of India for ten years. Likewise, in 2019 this alternative will come before India and it should give a policy direction that will be pro-people. A stable secular government will assume office in 2019, post elections, which is a way that always happens in our country, whether 1996, United Front, 1998, NDA, 2004, UPA, all formed after elections.